You can now create your engagement rings together for the big day. Weddings and engagements are usually known as a female thing, and the guy sometimes gets pushed aside. Some men genuinely have no interest in choosing engagement rings, and they let the woman pick the rings after the proposal. Practical but not very romantic for an engagement! But others desire a more hands on approach. A good way to bring the male into the process is for couples to create engagement rings together. Wedding ceremonies and formal engagements are intended to honor the special relationship between couples. The strain of preparing a wedding often causes couples to forget why they decided to get engaged in the first place. When this happens, it's a great idea for the couple to spend some time together without anyone else. Many couples decide to create engagement rings together as a way to bond during the preparation process. Plenty of couples spend hours shopping for rings together. So building one together is an even more intimate experience. Your day at the altar is a big deal. For most people, their wedding day is the most memorable day of their life. Even if a person marries more than once, they always remember the day they said "I do." That’s why creating engagement rings together can be such a magical moment. You’ll always remember the time you spent with your loved one creating the perfect ring. If you’re heavily into tradition, you may not want to create your own ring. You may want a traditional ring that comes from a jewelry store. Or you may want to be a little different. When you create engagement rings together, you can be as unique as you want. Custom made engagement rings allow you to show your uniqueness. Even traditionalists, who aren't comfortable trying new things, may get into the fun of creating a custom ring. What would it hurt? There's nothing wrong with shaking things up at bit. When you build an engagement ring together, you learn more about what your partner's likes and dislikes. As you work together to create your special rings, it brings the two of your closer. It’s gratifying and you'll always remember the experience. There are numerous ways to create engagement rings. You can purchase loose diamonds, and have them set in settings of your choice. Or, and this is probably the most fun, you can have a specialist create your rings from your drawings. Of course, all of this depends on how involved you want to get. It certainly will take longer to have a ring designed from scratch. If you don’t want to deal with that, then you can always create engagement rings using material that’s already available. You can design engagement rings in all types of shapes and sizes. When you start the creative process, you’ll be surprised at all the options available. Some people think all rings are the same, and if you've see a few you've seen them all. But when you create engagement rings together, you see that’s far from true. If you view a few rings for creative inspiration, you'll begin to appreciate the artistry. Next you'll start to appreciate how intricate and creative some rings are. Engagement ring design has come a long way. At one time, practically all engagement rings gems stuck to the basic round shape. But thanks to advances in gemstone cutting, it's now possible to have precious gems and especially certified diamonds, cut into a variety of shapes. You'll find some of the most common gem cuts listed below. The list isn't comprehensive, but it's enough to get you started. Heart - not many people create engagement rings using this cut; however, that's slowly changing. It's no surprise either, considering that the heart is a universal symbol of love. Cutting a gem into a heart isn't an easy task. Oval - if you've ever seen an oval, then you know it's similar to a circle. However, an oval is symmetrical and elongated more like an egg. It's recommended that you create engagement rings using this cut if you or your partner has little hands or thick fingers. 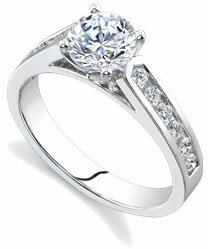 Round - this is a traditional cut and also the most popular diamond cut. If you want to stick to tradition, then this is the cut for you. Pear - this cut isn't all that popular for engagement rings just yet. It's more of a specialty cut. Maybe the best way to describe it is as a tear or a raindrop. You've more than likely seen pendants or earrings that use this cut. Marquise - this cut also as an elongated appearance, but unlike the oval, the Marquise has pointed ends. Emerald - this is a rectangular cut with rounded corners. It has wide, level surfaces that resemble stairs. That's why it's sometimes known as a step cut. If you create engagement rings that use this cut, but sure to use top quality gems. The emerald cut is known to highlight flaws. Things can seem a bit overwhelming when you create engagement rings together. There are literally thousands of options available to you. Your goal should be to create rings that have special meaning to both of you. If you need assistance you can give us a call toll free at 1-877-877-4141. We have helped thousands of couples with this decision and we would love to help you.